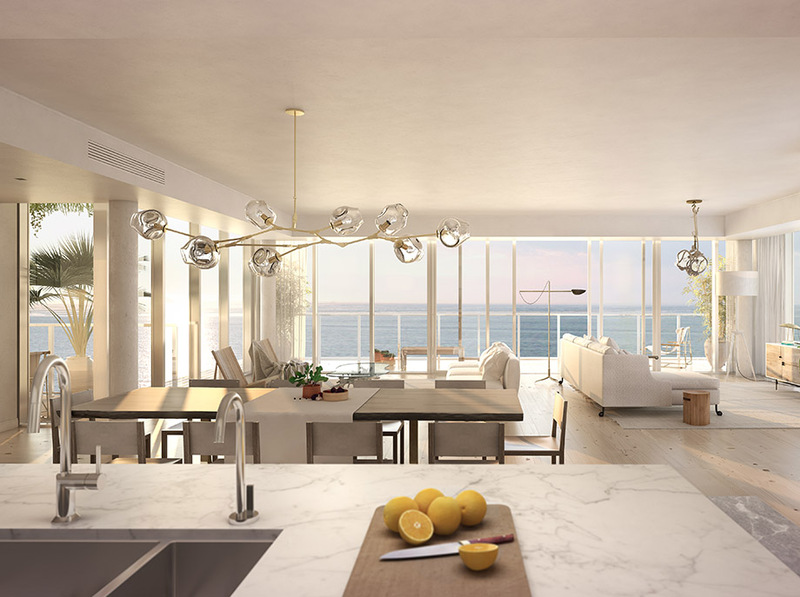 The developers of 3550 South Ocean, Palm Beach’s first luxury condo project in a decade, just unveiled a batch of renderings that include a first look at the project’s interiors. Designed by Garcia Stromberg and Kobi Karp, the renderings show off 3550 South Ocean’s contemporary style, terraces and interiors for the project’s 30 units. The seven-story development, located at 3550 South Ocean Boulevard, is currently in its preconstruction phase. It’s being developed by a group of companies with DDG acting as the lead partner. DDG CEO and Chairman Joe McMillan told The Real Deal that he expects to break ground in the first quarter of 2017, with completion slated for 2018. Kerry Warwick of Douglas Elliman’s Palm Beach office is handling sales, McMillan said, and a third of the units have been reserved so far. Those reservations are now being converted to contracts. Buyers are a mix of locals looking to downsize as well as out-oftowners from areas like the Northeast. Prices start at $2.3 million for a two-bedroom unit with 2,900 square feet of living space, and range up to nearly $6 million for a 3,400-square-foot residence. The penthouses have rooftop terraces, while all unit owners will have access to a beachfront swimming pool, sun deck with a fire pit and outdoor kitchen, plus a fitness center. McMillan said the developers have already lined up construction financing, though he declined to disclose the lender or whether the loan has yet closed.